DJ Jeremy from HD-DJ was the Sussex wedding DJ hired to perform for this Lovely couple, Emma and Scott. 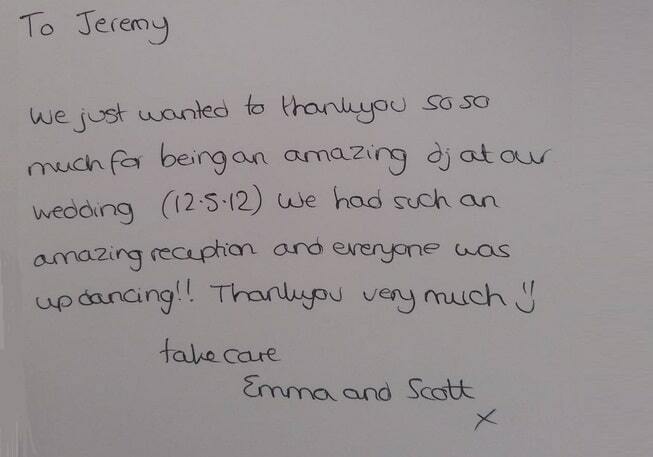 Emma and Scott hired Sussex wedding DJ Jeremy to perform a very memorable DJ set at their wedding party. The bride and groom hired Sussex wedding DJ Jeremy through TKR event management. They are one of the recommended suppliers for the Grand Hotel and Hilton Hotel in Brighton. They provide Entertainment, theming, draping and all the finishing touches to make your wedding or corporate event perfect. The Grand Hotel has Victorian grandeur, beautiful architecture and sea views, making this the quintessential Sussex wedding venue. A stone’s throw away from the beach; The Grand Hotel is perfect for couples who choose to have a sophisticated seaside wedding. Long established with a quirky charm, the elegant Brighton bandstand, stunning sea views making the perfect backdrop to your special wedding day. HD-DJ provide many extra services like Uplighting/mood lighting, Dance floors, Monogram projection and more. Emma and Scott only wanted Sussex wedding DJ Jeremy to provide his Evening only wedding DJ service. When booking our wedding DJ service, the bride didn’t want the lighting too over powering. Therefore the DJ installed a smaller lighting rig for this event. The brides favourite music was Kylie Minogue and Madonna but the groom loved Ferry Corsten & Sweedish House Mafia! Consequently it was a very varied DJ set. Emma and Scott opened up the dancing with the traditional first dance, choosing “Al Green – Let’s stay together”. After the first dance, the DJ played “Superstition” by “Stevie wonder” followed by some motown classics. As a result everyone was in the mood for a party. The highlight of the night for this Sussex wedding DJ was the reaction of the bride and groom when the DJ played “Punk” by Ferry Corsten!. That was just the start, at one point in the evening, after midnight it seemed like a rave going on. Therefore many of the younger guests were punching the air! The bride and groom certainly didn’t forget to thank this Sussex wedding DJ. Look at this lovely feedback they sent him. If your getting married, HD-DJ can provide our wedding DJ services. We provide DJ hire services in East Sussex, West Sussex, Surrey and London. If you are getting married abroad click here for our destination wedding DJ service.